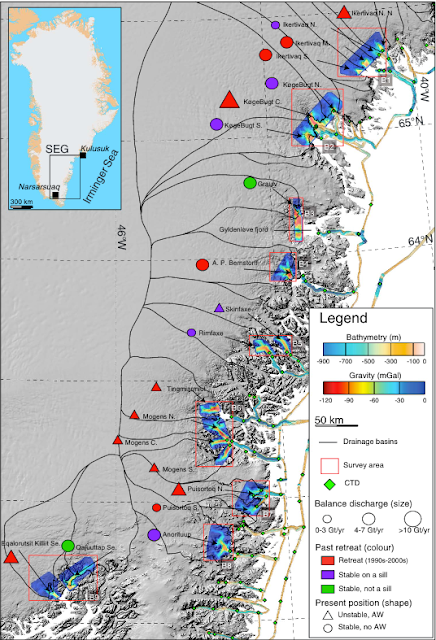 Rapid retreat : New seafloor data reveal that Køge Bugt (shown) and other fast-retreating glaciers in southeastern Greenland sit within deep fjords, allowing warm Atlantic Ocean water to speed up melting. Greenland is melting rapidly, but some glaciers are disappearing faster than others. 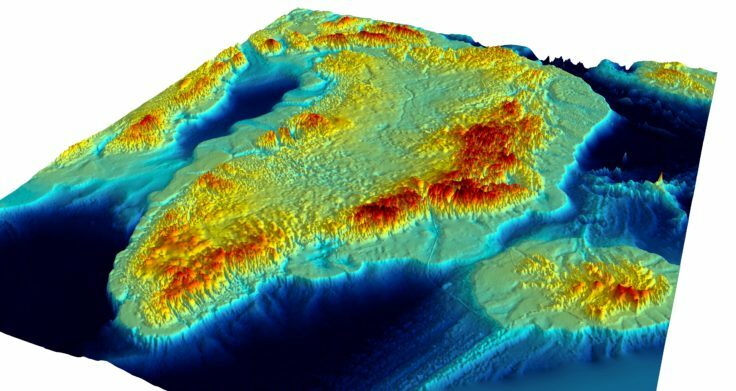 A new map of the surrounding seafloor helps explain why: Many of the fastest-melting glaciers sit atop deep fjords that allow Atlantic Ocean water to melt them from below. Greenland Basal Topography BedMachine v3 is published by British Antarctic Survey. Researchers led by glaciologist Romain Millan of the University of California, Irvine analyzed new oceanographic and topographic data for 20 major glaciers within 10 fjords in southeast Greenland. The mapping revealed that some fjords are several hundred meters deeper than simulations of the bathymetry suggested, the researchers report online March 25 in Geophysical Research Letters. These troughs allow warmer and saltier waters from deeper in the ocean to reach the glaciers and erode them. Free-air gravity anomalies (red to blue) in southeast Greenland overlaid on a shaded relief of the 30 m resolution latest version of the Greenland Ice Mapping Project (GIMP) DEM. Ocean Melting Greenland multibeam echosoundings are in shaded relief on a color scale from blue (deep) to orange (shallow). Other glaciers are protected by shallow sills, or raised seafloor ledges. These sills act as barriers to the deep, warm water, the new seafloor maps show. The researchers compared their findings with observations of glacier melt from 1930 to 2017, and found that the fastest-melting glaciers tended to be those more exposed to melting from below. Ice retreat : in 1932 (left), the front of the Mogens North glacier extended farther seaward than it did in 2013 (right). New data reveal that the seafloor is much deeper beneath the glacier than thought. The study uses data from two NASA missions — Operation IceBridge, which measures ice thickness and gravity from aircraft, and Oceans Melting Greenland, or OMG, which uses sonar and gravity instruments to map the shape and depth of the seafloor close to the ice front. The OMG mission also involves dropping hundreds of probes into the ocean each year to measure temperature and salinity at different depths. Scientists have long suspected Greenland’s melting may be accelerated by the ocean (SN Online: 7/6/11), but needed data on fjord depth and glacier thickness to prove it. The high-resolution OMG datasets, in particular, reveal bumps and troughs in the seafloor that were previously unknown, says glaciologist Andy Aschwanden at the University of Alaska Fairbanks, who was not involved with the study. Some of Greenland’s glaciers, such as Mogens North (top), have retreated rapidly, while others, such as Skinfaxe (bottom), remain relatively stable. New seafloor data reveal that some fjords, such as the one beneath Mogens North, are deeper (solid black line) than previous simulations suggested (dashed pink line). The data also show a land bump, or sill, at the mouth of Skinfaxe glacier, which prevents warmer, deep Atlantic water (yellow on temperature bar) from reaching the ice. Light blue represents the region in which the glacier’s ice front has advanced and retreated over time.